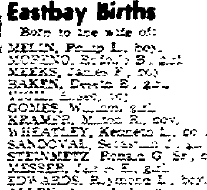 I may search newspapers for a birth listing because there is no available birth index for that date or I don’t know in which county or state the birth occurred. In the case where I’m searching for birth parents for an adoptee, I have the date of birth but not the given name or biological parents’ names. Newspapers publish recorded births around the date of the birth in their local area. Those list the father’s name and sometimes the child’s. Many of these papers are available on microfilm at the local library. Some of those have been aggregated into digitized collections that make it possible to find those birth records even if you don’t know a vital piece of information, such as birth name, date of birth or place where the child was born. But just because a newspaper is digitized doesn’t mean that it is searchable. If you’re looking for births, deaths, marriages or divorces that may have been published on a specific date, go to the vital records section and visually review the list of names. NewspaperArchive indexes and reproduces scans from the microfilm that are supposedly keyword searchable, but page scans may be so muddy that the letters are not distinct. Not even this heading is searchable. And the scan of the birth records is worse. If you need a clearer image of the page, you now know the name of the paper, the date of publication and the page number. You can review the microfilm or get the repository to print it, which will be more readable. This paper gives the gender of the child and the father’s name, only. Usually that’s enough information to find the birth name. This entry was posted in Adoption, Genealogy, Public Records, Vital Records. Bookmark the permalink.